SpeedPro created this beautiful artwork layered on top of bright yellow PVC for a local DHL office. 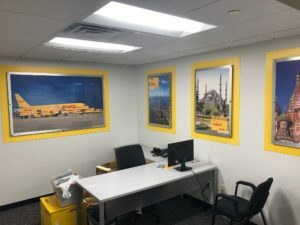 Besides attracting your eye, these images inform people that DHL is an international company and show how long they’ve been in various countries. Use artwork to convey important messages and make your walls brighter with SpeedPro! Great customer service. Quick turnarounds. Quality work.